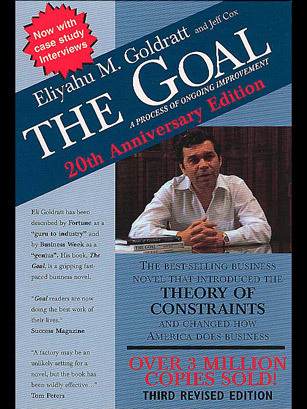 Eliyahu Goldratt's The Goal is unusual among business management books for at least two reasons. First, Goldratt wasn't a titan of industry, a b-school professor, or even a consultant, but rather a physicist. Second, The Goal is a novel. Centered on a production manager named Alex Rogo who has three months to turn around a deficient, unprofitable manufacturing plant, The Goal explains the "Theory of Constraints," which among other points incorporates the idiom, "A chain is only as strong as its weakest link;" and focuses on bottlenecks, the great hindrances to productivity. Rogo uses the Socratic method to help fix his marriage, then applies it to his plant crew, coming up with steps to solve the plant's problems. The Goal has been in print since 1984, and a revised third edition was released on the book's 20th anniversary. So does Rogo achieve his goal? You'll have to read it to find out.